Vienna is old, Vienna is new – and so diverse: from the magnificent Baroque buildings to “golden” Art Nouveau or the latest architecture. Vienna is packed with imperial history; at the same time it has exciting contemporary museums, lively eating and a vibrating nightlife, but also many quiet corners to explore. Few cities can boast the imperial grandeur of Vienna, once the center of the powerful Habsburg monarchy. 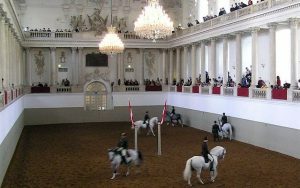 Lipizzaner stallions performing elegant equine ballet, the angelic tones of the Vienna Boys’ Choir drifting across a courtyard and, outrageously opulent palaces. The Mercer Study has chosen Vienna as the world’s number one most livable city for the sixth time in a row in 2015. More than half of the metropolitan area is made up of green spaces. 280 imperial parks and gardens enrich the cityscape. In spring, 400 species of rose bloom in the Volksgarten alone. The nearby recreation areas of Prater, Vienna Woods and Lobau invite visitors to go on walks, day trips, hikes and bicycle tours. Vienna has a total of 2,000 parks. It’s hard to imagine a more livable city than Vienna. This is a metropolis where regulars sit in cozy coffee houses and offer credible solutions to the worlds chaos over the noble bean; where “Beisln” (bistro pubs) serve delicious brews, wines and traditional food; where talented chefs are taking the capital in new culinary directions; and where an efficient transport system will ferry you across town from a restaurant to a post-dinner drink in no time at all. It’s safe, it has lots of bicycle tracks and it even has its own droll sense of humor. Twentieth-century designs are little short of inspiring, while contemporary Vienna is constantly being given new and exciting infrastructural designs such as the new Twin City Liners boat landing and the enormous Hauptbahnhof. Vienna is one the most musical cities in the world. This is partly due to the vast number of great composers and musicians who were born here or lived and worked here. 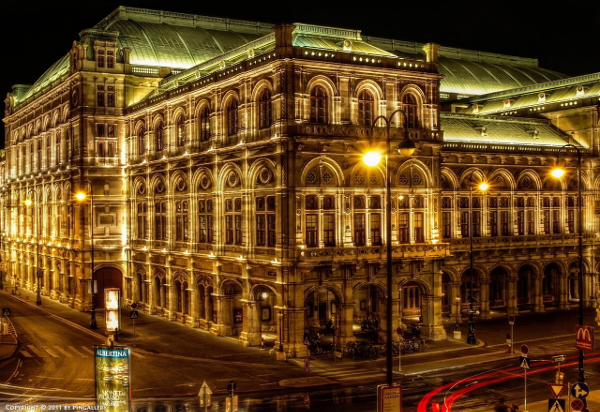 Visiting Austria’s capital therefore means experiencing the works of Mozart, Haydn, Schubert, Beethoven, Johann Strauss and many others in venues like the Staatsoper and Musikverein. The music of Bach and Händel continues to be performed in Vienna’s historic churches today, and Vienna’s Collection of Ancient Musical Instruments, paired with a visit to the Haus der Musik, takes you deeper into the texture of music and how it is created. Vienna also hosts several international events such as the famous opera ball that takes place every year in February, which is taking place in the Vienna State Opera. The Life Ball, one of the biggest AIDS charity events worldwide also takes place in Vienna and is held in front of the city hall. Each Life Ball is attended by stars, designers and politicians from all over the world such as Bill Clinton, Katy Perry and Charlize Theron and Jean Paul Gaultier. Furthermore Vienna hosted the 60th Eurovision Song Contest in May 2015. In 2016 Vienna will also host the Rock festival “Rock in Vienna” (03.06.-05.06.2016) and the “Donauinselfest”/“Festival on the Danube Island” (24.06.-26.06.2016) on the Danube Island. There are many other events hosted in Vienna every year such as the “Jazz-Fest Wien”, the “Wiener Wiesn-Fest” (similar to the Oktoberfest in Munich, but smaller), the Vienna Design Week, the Summer-Night Concert in Schönbrunn and several Christmas markets all around the city. Walk in the footsteps of the Habsburgs, visit the splendid baroque Schönbrunn or Belvedere Palaces, or stroll along the magnificent Ring Boulevard to take a look at the heart of the former vast Habsburg Empire, the Imperial Palace. Get a sense of the luster and glory of the old empire by visiting St. Stephen’s Cathedral, the Spanish Riding School, and the Giant Ferris Wheel at the Prater, as well as the sarcophagi in the Imperial Vault. Schönbrunn Palace: Visit Empress Sisi’s former summer residence. This baroque complex contains an enchanting park, the Palm House, the Gloriette and the zoo. Spend an entire day at Schönbrunn: visit the show rooms with a “Grand Tour with Audio Guide,” admire the splendid Bergl Rooms, and stroll through the “Labyrinth”. The Schönbrunn Zoo in Vienna is the oldest existing zoo in the world and has been named Europe’s best on three occasions. Each year more than two million visitors come to see the pandas, new-born elephants and many other rare animals. Sisi Museum: Beautiful and celebrated Empress Elisabeth has long since become a cult figure. The Sisi Museum in the Imperial Apartments of the Imperial Palace compares the myth and the facts. Among the highlights are numerous personal objects once owned by Elisabeth as well as the most famous portraits of the beautiful empress. The Spanish Riding School: The Spanish Riding School in only a few steps away from the Sisi Museum and celebrated its 450th anniversary of its first written mention with gala performances on Heldenplatz in 2015. St. Stephens Cathedral: St. Stephen’s Cathedral is the symbol of Vienna. Construction commenced in the 12th century. Today, it is one of the most important Gothic structures in Austria. 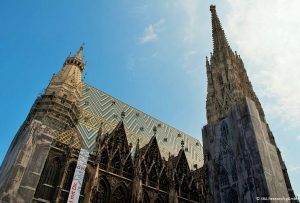 Stephen’s Cathedral is located directly in the city center, at the religious and geographical heart of Vienna. It´s giant Pummerin bell features on television as it rings in the New Year. The Ring Boulevard: Emperor Franz Joseph officially opened Vienna’s Ring Boulevard (Ringstrasse) on May 1, 1865. Vienna celebrated its 150th birthday in 2015 with numerous events and exhibitions. The most beautiful boulevard in the world not only rich in sights, it also has large parks, important monuments, and much more. About 800 buildings line the boulevard today. Additional sights on the Ring Boulevard, aside from the many opulent buildings, include the black-gold lattice fence in front of the Hofburg, the world’s longest fence from the age of Historicism, the 5.5-meter-tall Pallas Athene statue in front of the Parliament, and the “Rathausmann”, a statue of a man on the tower of the City Hall. Viennese Prater: The Wiener Prater is a large public park in Vienna’s 2nd district. When people talk about the Wiener Prater they often mean the “Wurstelprater”. The so called “Wurstelprater” is the oldest amusement park in the world. 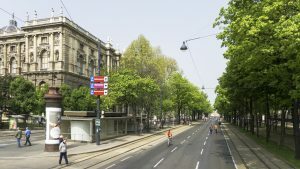 But the Wiener Prater consists of more: the Hauptallee (the main alley), the Krieau and the Praterstadium (Ernst Happel Stadium) belong to the area of the “Wiener Prater”. 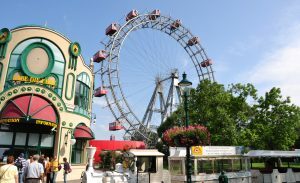 The Vienna Giant Ferris Wheel and its Square: You may want to visit this landmark of Vienna and enjoy the view of the city from almost 200 feet up. The Giant Ferris Wheel is open year round and is one of the most frequented attractions in the Danube metropolis. Now this entrance to the Prater amusement park is a nostalgic theme world reminiscent of the Prater in the year 1900. The traditional city inn “Eisvogel” has returned to the Prater and offers award-winning Viennese cuisine. At Madame Tussauds, visitors can encounter celebrities from around the world up close: from Arnold Schwarzenegger to Falco, Empress Elisabeth and Gustav Klimt to Robbie Williams and Nicole Kidman. 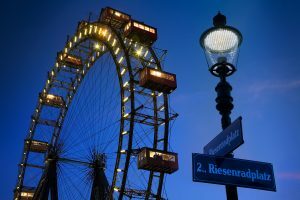 Today, the Giant Ferris Wheel offers an attractive adventure world: at the entrance area, a “Panorama” tells the history of this monumental Ferris wheel and the City of Vienna – with nostalgic installations that drift past you in giant Ferris wheel cars. Vienna is famous for its cuisine, its coffee house culture and the ‘Heurige’ wine taverns. Vienna boasts one of the world’s most famous culinary traditions. A diverse yet delectably harmonious range of dishes reflects the city’s mix of nationalities and food cultures through the centuries, and inspires visitors from all over the globe. Café Central, the legendary literati café, which counted Arthur Schnitzler, Peter Altenberg and Adolf Loos among its regulars. Gerstner K&K Hofzuckerbäcker, represents the highest-quality confectionery since 1847. Café Imperial, serving fine Viennese coffeehouse cakes since 1873. Café Sacher, offers the perfect chance to treat yourself to a slice of the legendary Original Sacher-Torte. Vienna’s eateries – ranging from the typical Viennese “Beisl” (tavern) to the luxurious gourmet temple – offer the entire spectrum of regional and international delights to please the palate. Brickmakers: smoked barbecue (the meat is smoked 13 hours before serving), Cider and one of the best beer collections. Schweizerhaus: restaurant where they have the famous “Stelze” (part of the pig’s leg), they also offer drought Budweiser beer. Crossfield’s Australian Pub: offering burgers, BBQ and Australian specials such as crocodile steak.